With chapters covering fresh and delicious breakfasts to start your day well; simple, sumptuous lunches to enjoy at home and on the run; and comforting dinners that show you how to eat the rainbow, Cook. Eat. Love provides over 100 recipes that will have you eating happily and healthily at every meal time. 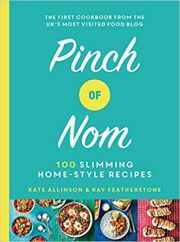 A pescatarian herself who cooks meat for her family, Fearne includes recipes that can cater for both and be packed with goodness either way. You'll also find plenty of ideas for elevenses, afternoon treats, baked goods and desserts that use plenty of natural ingredients to make those sweet treats guilt-free and just as satisfying. From Thai Coconut Soup to Quick and Healthy Pizzas; Roast Chicken Cashew and Chilli salad to Salted Caramel Chocolate Slice and Beetroot Cupcakes, Cook. Eat. Love is guaranteed to bring joy to your kitchen and beyond.